Lausanne (AFP) – North Korea will send 22 athletes to next month’s Winter Games in the South, the International Olympic Committee said Saturday, approving a landmark deal between two nations still officially at war. South Korea had hoped that the Games which begin in Pyeongchang on February 9 could help ease the crisis on the peninsula plagued by months of rising tensions over the North’s nuclear and missile and programme. In a surprise New Year’s announcement, the leader of Stalinist North Korea Kim Jong-un said he was open to sending a delegation to Pyeongchang. Before this week’s meeting at IOC headquarters in Lausanne, the two Koreas had already agreed on a set of momentous compromises, including delegations from both countries marching together at the opening ceremony and the formation of a unified women’s hockey team. 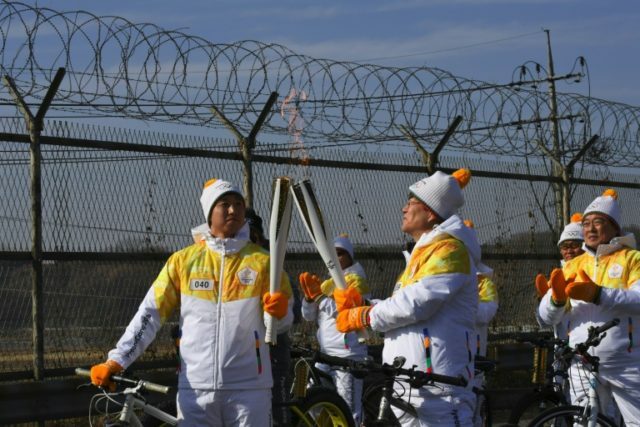 But the two Koreas still needed approval from the IOC, as the pact required the suspension of some basic Olympic rules. IOC president Thomas Bach gave that approval Saturday, announcing that 22 athletes had been cleared to compete in three sports and a total of five disciplines. Those include figure skating, short-track speed skating, cross-country skiing and Alpine skiing, as well as hockey, with the IOC having approved the entry of the joint team, despite concerns voiced by some hockey federations over fairness. At the opening ceremony, the joint delegation “will be led into the Olympic stadium by the Korean unification flag” carried together by athlete from each country, the IOC said. A special unity uniform will be created for the event. No North Korean athlete had technically qualified for Pyeongchang, so Saturday’s announcement required extending qualification deadlines in the sports concerned. “Today marks a milestone on a long journey,” Bach said after the closed-door meeting with the leaders of the Olympic committees from both Koreas as well Pyeongchang 2018 organisers, and senior government officials from the two countries. “The Olympic Winter Games in Pyeongchang are hopefully opening the door to a brighter future on the Korean peninsula, and inviting the world to join in a celebration of hope,” Bach said. North Korea has taken part in seven of the last 12 Winter Olympics, most recently in Vancouver 2010. But its presence in Pyeongchang — just 80 kilometres (50 miles) south of the demilitarised zone that divides the Koreas — is a significant diplomatic coup. North and South Korea remain technically at war since the Korean war ended with armistice, not a peace treaty, in 1953. North Korea will also send 24 officials and 21 media representatives to Pyeongchang, Bach said. Seoul and the IOC will have to ensure that while accommodating the North and ensuring that the so-called “peace Olympics” pass off smoothly, they do not violate United Nations sanctions. Security Council measures currently prohibit cash transfers to the North, while the UN has also drawn up a blacklist of officials tied to the Stalinist Pyongyang regime, individuals whose presence at the Games will create potential stumbling blocks.